Smash a wearable bracelet for tennis players allows them to record their movements and review them afterward on the Android or iPhone App. Currently Smash is in the prototype stage and requires a large sum of $200,000 AUD over the next month and a half. Smash founder Rob Crowder says that level of funding is required to take the current prototype to commercial product. 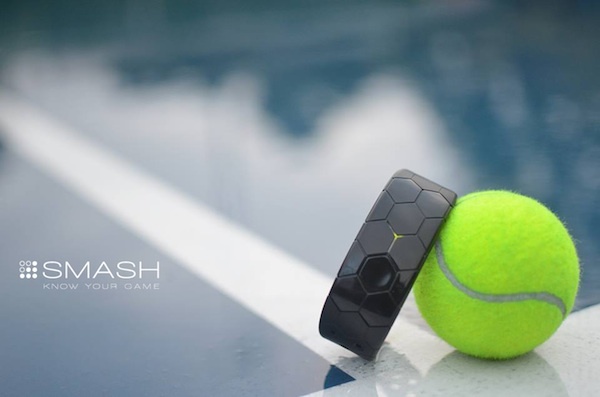 In Smash’s case, major sports like tennis are hugely popular with some 78 million tennis players globally, so the potential market for this dedicated wearable is not limited. If people behind Smash get successful in building an engaging social presence for it then they can tap a fair share of these players. So what exactly does Smash do? It has been designed to coach the user, offering analysis of their play, as captured via the wearable which includes overviews of entire games and recommendations for how to improve, via the companion app. The Smash bracelet contains a variety of sensors including a 9-degrees of freedom sensor array with triaxial accelerometer, gyroscope and magnetometer. Which will enable it to measure even the smallest factors like wrist rotation, stroke trajectory, impact point consistency and overall technique consistency etc. The wearable is being developed for tennis initially but the startup is also considering other sports where the device could be applicable, as another way to expand its future addressable market. However, all of this would vanish if Smash cannot raise enough cash to get to production. Currently the campaign has raised just under $15,000 AUD, so it is pretty shy of its goal yet. And if they are going to be able to deliver on their wearable gadget then they have to get backers fast. The early bird Kickstarter backer price for the Smash wearable is $129 AUD, with an estimated shipping schedule of next February.